By the dawn of the sixties, a rising generation of record-buyers was succumbing to the palpitations of rock n’roll and the Twist, so how could two natty Juilliard alumni in black horn-rimmed glasses hope to woo America just by tickling the ivories? That question got an immediate answer in 1960, following the extremely successful release of their “Theme from The Apartment.” These already seasoned stage veterans underwent a major career shif: their concerts stated selling out practically overnight, they looked forward to several Top 40 hits, and many of their fans turned out to be teenage girls! 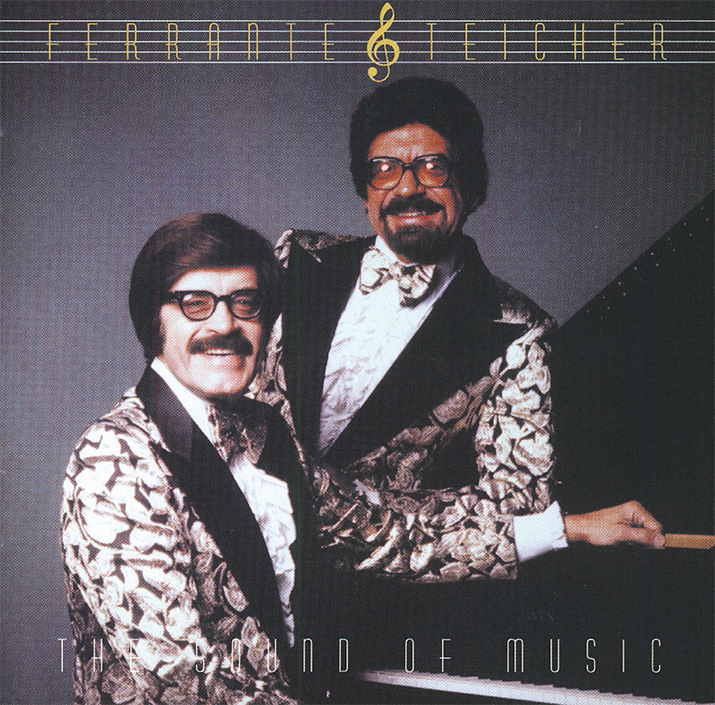 Soon, Ferrante & Teicher were preeminent pop radio stars who went from being mere “duo-pianists” to a resplendent “two-man show.” They serenaded the world with the greatest romantic ballads, and the zaniest of novelty numbers. In the twenty years (1959-1979) that they recorded for United Artists Records, their signature sound included a full orchestra, with strings, horns, voices, and their two nine-foot concert grands. This collection also typifies Ferrante & Teicher’s penchant for tuneful time travel. They take us back to the pre-Civil War days on the “Stephen Foster Fantasy,” contrasting the raucous minstrel songs like “Camptown Races” and “Oh, Susannah” with the tender romantic melodies like “Jeanie With The Light Brown Hair” that the composer himself preferred but for which he is unfortunately less remembered. Flash-forwarding a century, they pay their double-grand tribute to Rodgers and Hammerstein on “The Sound of Music Overture.” The “Simon & Garfunkel Medley” veers from Tin Pan Alley standards to the “new classics” of this mid-to-late sixties, offering a melodic bridge over what was once a troubled “generation gap.” The delicate handling of Morris Albert’s “Feelings” represents Ferrante & Teicher’s more subdued mid-seventies period, when many of their recordings were featured on the now greatly missed “Beautiful Music” radio formats. The banter would get even stranger with Ferrante saying: “I enjoy playing this number — I could play it all night long — it always gets such applause!” Teicher would then counter with: “If I have to play this number one more time, I’ll fall asleep — I don’t know why we do it anyway — it NEVER gets much applause — and I won’t be able to stand up to take my bow anyway—in these TIGHT pants — sure hope I don’t rip them!” This madcap badinage would transpire for up to five minutes, leaving the fans giggling and the renowned French composer probably cringing under his headstone. With their blend of virtuosity and good natured horseplay, Ferrante & Teicher may have twitted some purists, but they satisfied the music-loving masses with evenings of entertainment and a fun-filled musical education. When asked why they chose a more pop direction, Ferrante would answer rhetorically: “Which would you rather do? Perform in a church for 300 people while playing the classics? Or would you rather perform at Atlanta Constitution Hall with roughly 6000 people at standing room only?” It is, therefore, with equal parts Americana, classical, romance, humor — and a few dashes of madness — that Ferrante & Teicher commemorate their art of the fourhanded rhapsody.